Mollah Barir Bou: A breath of fresh air? Since the megahit Moner Majhey Tumi, mainstream Bangladeshi films have been going through an extended drought. The recent success of Mollah Barir Bou, might just be the rejuvenator our filmdom needs. Incidentally, both Moner Majhey..
.and Mollah...have been produced by Motiur Rahman Panu. Seems like Panu has the 'Midas touch'. What is it about Mollah...that the audience is finding so endearing? Tickets are selling like 'Haji's biriyani' at Star Cineplex and Madhumita. The crowds outside the theatres obviously indicate the movie going the golden way, like a certain Beder Meye Josna did years ago. Mollah...deals with the rural life, its simplicities, naïveté, demons of ignorance, superstitions and the perpetual desire of men to dominate women. Sounds like an impressive theme but does the movie succeed in conveying its messages? The movie revolves around Gazi Ebadat Mollah, his son Jowan Gazi who doesn't seem to have grown up from the "daddy's little boy" phase and Jowan's nature-loving eccentric wife, Bokul. Over the years we've seen several characters in movies that are overwhelmed by the splendour of nature but this is perhaps the first time that a character has been labeled specifically as "nature-lover" in a Bangladeshi movie. Mollah owns a vast property (about 200 bigha) and is an influential figure in the village. Jowan, sporting a hideously fake-looking wig and moustache works on his father's lands and occasionally snitches to Mollah about his wife's weirdness. The weirdness, according to both Mollah and Jowan is Bokul being memerised by moonlight and the cooing of cuckoos. Bokul wanders around the village, prances around trees and takes dips in the pond. As a result of her 'extra-curricular' activities Bokul has a miscarriage. Mollah is infuriated. That means little to Bokul who goes about her old ways as soon as she recovers. Bokul becomes pregnant again and again she loses the unborn child. This time Mollah just doesn't forgive her. He declares Bokul is possessed by some evil spirit and asks the Ojha (witch doctor) to perform an exorcism on her. Bokul is publicly abused and humiliated in the name of 'getting rid of bad spirits'. She is devastated and vows never to go out of the house again. Meanwhile, Mollah wants a successor and picks the 'gossip queen' Parul to be his son's second wife. Although Parul is just a housemaid, that doesn't become an issue as Mollah just wants a beautiful daughter-in-law. Unlike Bokul, Parul is cunning and she soon manages to give Mollah a taste of his own medicine. She convinces everyone that her father-in- law is possessed and calls in the Ojha to treat Mollah to the infamous bansh-dola (beating with a bamboo shaft). Hell, she even manages to give her husband a make-over. All is not well though. Mollah cannot tolerate Parul messing up his domain and decides to get rid of her once and for all. Just when he is about to strike Parul in her sleep, Bokul smites him from behind. An altruistic Parul decides to take the blame for the murder and goes to prison, leaving Bokul and Jowan to live happily ever after. The movie's script has been written by veteran actor ATM Shamsuzzaman who also plays the role of Mollah. Sophisticated movie buffs may not enjoy the movie but a mainstream movie's success relies on the masses, not a handful of persnickety movie critics. The director Salahuddin Lavlu, who's previous endeavour was the hugely popular TV serial Ronger Manush, seems to be an expert on comedy in village-life. Emon Shaha's music is ok, nothing to rave about. ATM Shamuzzaman as Mollah is as usual superb. The surprise factor of the movie however, is Shabnoor. Who knew the actress has impeccable comic timing? Riaz as Jowan does a reasonable job, considering he didn't have much to do. Moushumi as the eccentric Bokul seems credible. Specifically, the scene where Bokul has a miscarriage in the pond is gripping. Powerful actor Keramat Mowla as the Ojha creates sparks in his brief role. 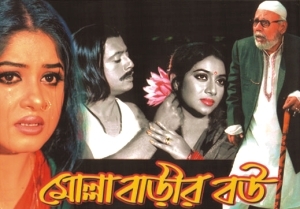 Chitralekha Guho as the Baishnabi is in the movie just to validate two folk numbers by Momotaz. The verdict: the movies excels in delivering positive social messages and should be regarded as a breath of fresh air amidst the current barrage of vulgar movies.